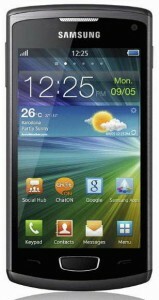 Samsung will bring three smartphones to the IFA 2011 (September 2-7, Berlin, Germany), the Samsung Wave 3, the Samsung Wave M and the Samsung Wave Y. All three handsets are its first smartphones that running on its proprietary bada 2.0 platform. As noted, the bada 2.0 operating system has an improved features when compared to its predecessor, including Near Field Communication (NFC), Wi-Fi Direct support, push notifications, a new UI with more customization options, voice recognition, and multi-tasking. The Bada 2.0 is also brings ChatON mobile communication service. The Samsung Wave 3 smartphone is packs a 4-inch Super AMOLED touchscreen display with a resolution of 800 x 480 pixels, a rear-facing 5-megapixel camera, a front-facing 0.3 megapixel camera, GPS / GLONASS, and a 1,500 mAh battery. Heart of the Wave 3 phone is boasts a 1.4GHz processor and 3GB of internal memory. 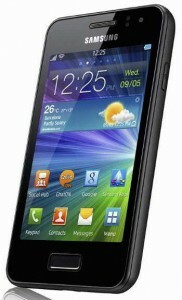 As connectivity, the Samsung Wave 3 smartphone has 802.11 b/g/n WiFi with WiFi Direct, and Bluetooth 3.0. Its dimensions are 126 x 64 x 9.9 mm and weight 122 grams. The Samsung Wave M is brings a 3.65-inch touchscreen display with 480 x 320 resolution, two cameras (5MP rear and 0.3MP front), and optional NFC. New Wave M phone is sports an 832MHz processor, 802.11 b/g/n Wi-Fi (Wi-Fi Direct supported), and Bluetooth 3.0. Dimensions of Samsung Wave M are 114 x 63 x 12.2 mm and weight 121 grams. New Samsung Wave Y smartphone has a 3.2-inch touchscreen display with a resolution of 480 x 320 pixels, an 832MHz processor, 2 megapixel camera, 802.11 b/g/n Wi-Fi, and Bluetooth 3.0. Dimensions of Samsung Wave Y are 110 x 58 x 12.3 mm and weight 102 grams. All of them are made in the bar-type form factor and HSDPA support. The Samsung Wave 3, Wave M and Wave Y smartphone will be available this fall.